This past Tuesday night I had one of the most unusual and memorable evenings. 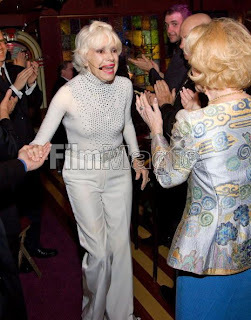 I had been invited to see Carol Channing inaugurate a new cabaret series at L.A.'s Magic Castle, a huge old mansion sitting on a hill off Franklin Avenue in Hollywood that is a kind of private club for magicians. Historically, entry is granted only to members and invited guests. For this new cabaret series, however, a limited number of tickets are available to nonmembers. 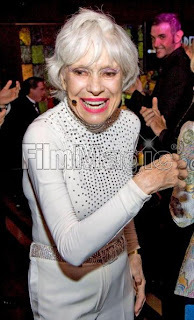 I was looking forward to the event mostly because I've never seen Carol Channing live -- not even in one of her 5,000+ nights spent playing Dolly Levi in the many iterations of Hello, Dolly! over my lifetime. So there was a certain camp factor. Also, I had never been inside the Magic Castle, so it seemed like it would be a great combination. I was not prepared for effect she would have. First of all, our seats were amazing. A stage-side table on the stage-left side in what was already an incredibly intimate room. When the 88-year-old Miss Channing finally took the stage, she was never more than about 10 feet from us -- most of the time considerably closer. She's had a couple of hip operations in the past year, so she moves very carefully and is wafer thin. There is a certain fragility in her physical presence. But mentally? Emotionally? Intellectually? This woman is so sharp. I was blown away by her intelligence. I think she might be off-the-charts MENSA smart. She mostly told stories, sprinkled with snippets of songs here and there. But among her first bits was a recalling of her initial audition for the president of William Morris all those years ago. Coming from a small, intellectually rigorous women's college in New England (Bennington), she thought for sure he would appreciate a serious song in old French telling the story of Orestes. And suddenly she's singing it, in this low, gutteral voice. And it just keeps going! It was at turns hilarious and mind-bogglingly impressive. For an encore with the big wig at the agency, she sang a song in some ancient language that was written in 9/5 time ("Oh, you know about that?" she says with flawless timing when audience members laugh at the obscure time signature). She borrows a drum from her drummer and proceeds to bang out 9/5 time and begin this bizarre chant-like number. I don't know if it translates here, but I just couldn't believe my eyes and ears! It was like some strange celebrity fringe festival act. The cognitive dissonance of watching the daffy Dolly Levi acting out such a moment was delightfully disorienting. She has incredible recall of events and conversations, or certainly a finely-honed aptitude for making it appear so. And to watch that razor-sharp comic timing as up close as you can be was a dream. Among those sharing the room with me and Miss Channing were Lily Tomlin and her longtime partner, Jane Wagner. Lily has an old bit about RSVP'ing for events as "Lily and, maybe, Jane," because Jane is a famous last-minute canceller. Well, Jane was there, so Carol must rate. 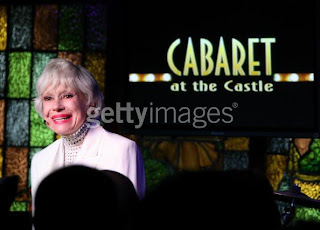 And watching those two incredible talents watching Carol Channing was a treat in and of itself. Lily was like a good student, soaking up every bit of business and watching with appreciation and wonder. The event was meant to benefit a new initiative Miss Channing is launching to get the arts back in California public schools. Most people at 88 wouldn't take on such an ambitious mission, but that says something about her restless spirit and mind I suppose. This photo shows her greeting Tippi Hedron on her way out. I like it because you can fully appreciate the incredible condition she is in. There aren't many 88-year-olds who can take off their white jacket part-way through a show and continue to perform in a tight, shiny turtle-neck number, but there she was. Again, I went thinking it would be a hoot and came away inspired by this woman's incredible mind, unstoppable energy and brilliant gifts of timing and presence. An unforgettable night.